The horse meat scandal in Europe continues to spread as investigators find more tainted beef products and consumers are roiling with shock and disgust. Food safety authorities there say beef lasagna products that contained more than 60% horse meat have been recalled from stores in Britain, the Associated Press reports. Sweden also has recalled packaged lasagna suspected to contain horse meat. The lasagna was tested as part of a continuing investigation into mislabeled meat. Last month the Food Safety Authority of Ireland said it had discovered horse and pig DNA in burgers sold to stores and restaurants — including Britain’s largest supermarket chain Tesco and fast food giant Burger King — in Ireland and the United Kingdom. Millions of burgers have been removed from store shelves. 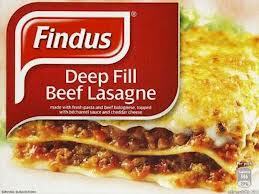 The U.K. Food Standards Agency said that of 18 beef lasagna products tested by French frozen food company Findus, 11 were found to contain 60% or more horse meat, A.P. reports. There is no evidence of a food safety risk, but the agency said the lasagna also will be tested for veterinary drug phenylbutazone, a drug sometimes used to treat animals that isn’t allowed to enter the food chain because of human health risks. Meanwhile, the British government accused unknown criminals for the growing scandal, and the Food Standards Agency asked police in London and elsewhere in Europe to investigate, says Reuters. Send it to the Syrian refugees …. and a few Lebanese I know … no charge.